If you’re studying away from home or are attending college in your hometown but don’t yet have your own set of wheels, you may be craving the independence a car could provide. You know that many people finance auto purchases through car loans, but since you are young, you don’t yet have a long credit history or terrific credit score. Getting a car loan is not always easy. If you are a student looking to get your first auto loan, prepare ahead of time. Short of begging your parents for money, what’s a student to do? Saving up a pile of cash when you are young might be one of the most difficult things you have ever done. It takes discipline. Watching all your friends with the latest tech gear and fashion can easily sidetrack your financial goals. Financial decisions you make early in life can affect you for a long time. If it is a car you desperately need, sacrifices need to be made. Shoot for a down payment of 5 to 10 percent of the vehicle's value. Putting money down on a car loan will not only reduce your monthly payment, but it could also lower your interest rate. All lenders look favorably on someone who has worked to save up a down payment. Getting a steady income is crucial to getting a car loan on your own. A steady income is the downfall of many college students wanting a car loan. It is tough to get a flexible, good-paying job and juggle college at the same time. If a steady income isn’t happening for you anytime soon, check the option below. The easiest way to get approved for a car loan if you are a student is to get a co-signer. A co-signer is someone hopefully with a full-time job and good credit who is willing to vouch for your ability to pay the loan on time. A co-signer is taking on responsibility for the car loan if you fall short. Not only are you more likely to get approved for a student car loan with a co-signer, but often you will get a better interest rate. A lot of different places offer car loans. It is important to shop around for the best deal. Check with the credit union or bank you currently do business with. Credit unions often offer up to 1 percent lower interest rates on car loans than banks. Online lenders usually work on a massive scale and can also find you a low rate. One source does not stand out above the rest for everybody. You need to check around to see what car loan source is the best for your situation. Definitely consider refinancing your car loan in one to two years. If you have been making your payments on time, you have proven your ability to make your payments. Plus, your credit score is probably either becoming established or improving. Ask your current lender if it is possible to lower your current rate or start shopping for another car loan. It is possible to cut your interest rate in half after a year or two of on-time monthly payments. As a student on a tight budget, it is imperative to think about all the expenses tied to a car purchase. Full coverage car insurance is usually required on a vehicle with a loan. Be sure to get your car insurance quoted before signing for your car loan. Depending on your age, driving history, and prior insurance, the cost of insurance could be high. Also, consider the cost of fuel and vehicle maintenance. It won’t be any fun having your own set of wheels if you can’t afford to drive it anywhere. Sometimes a student car loan is your only option. You don’t want to drive around a beater that will leave you stranded on the side of the road on a regular basis. Even if you lack a strong financial base, do not assume you would not qualify for a car loan. Students can usually get a better deal than borrowers with bad credit. 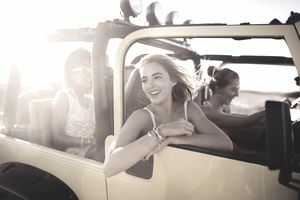 There are a few ways to help secure a car loan, but a new vehicle as a student is not usually a sound financial decision. Is it Possible to Get a Car Loan With No Credit? Is an Extended Car Loan Right for You?